HeLa cells were transfected for 48 h with either scrambled siRNA (lane 2) or four different human ABIN-1 siRNA (Dharmacon) (lanes 3-6). 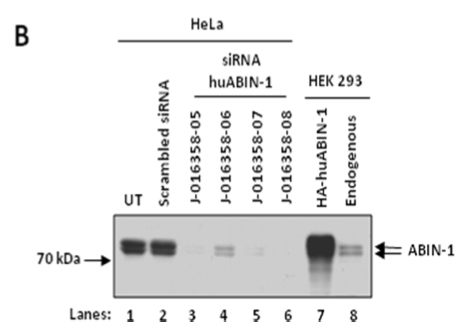 HEK 293 cells were transfected for 24 h with DNA encoding HA-ABIN-1 (DU 8699, lane 7). Lanes 1 and 8 are untreated HeLa and HEK 293 cells, respectively. The cells were then lysed and the lysates denatured in SDS and subjected to SDS-PAGE on 8% gels. After transfer to PVDF membranes, immunoblotting was carried out overnight with anti-ABIN-1 (0.5 μg/ml). 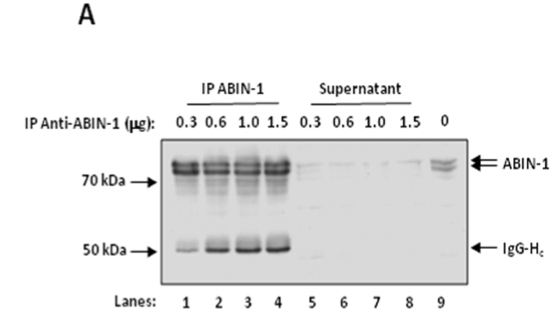 Binding of the primary antibody was detected using rabbit peroxidase conjugated anti-sheep IgG antibody (1 in 10, 000 dilution, Pierce) followed by enhanced chemiluminescence (ECL, Amersham).